For base colors, I used Revlon Emerald City for my left ring finger, Lucidarling White on my right ring finger, and China Glaze China Rouge for all the other nails. These were all applied in 2 coats. This design is quite versatile. If you don't feel like having an accent nail, the polka dots over a red color base is enough for a Christmas manicure. 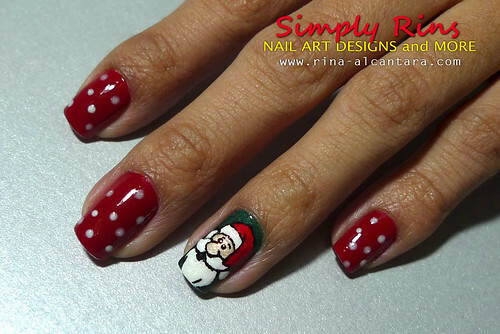 Santa Claus makes an appearance on my nails before Christmas! Even as a kid, my parents were quite honest to tell me that there is no Santa Claus. When I grew up, I never really felt sad about it but I did figure out how important he is to children during the Christmas season. As he is said to make a Christmas list of good children all over the world, kids are given incentives (so to speak) to be good so they will receive a wonderful gift from Santa Claus on Christmas. 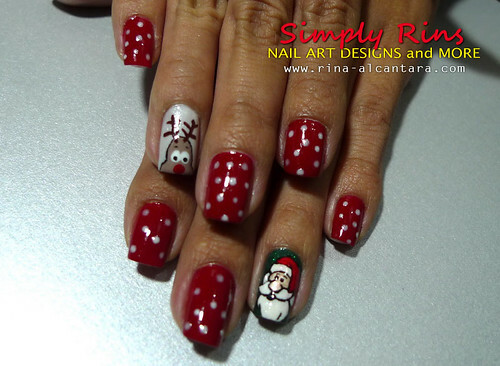 Rudolph the red nose reindeer is peeping out of my nail! 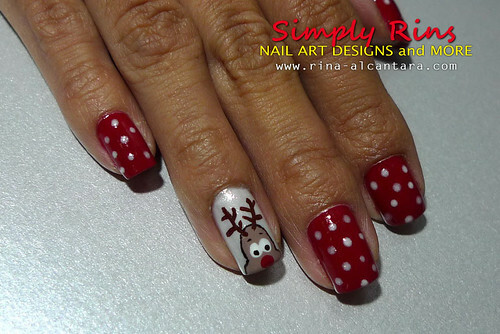 I decided to paint Rudolph on my right ring finger to accompany Santa Claus. I personally really love how this turned out. I was thinking of exaggerating his red nose. I think that would look hilarious! Among Santa Claus' flying reindeers, Rudolph is the most popular because of his shiny red nose. He leads the pack when Santa is delivering presents on Christmas Eve. The other eight are Dasher, Dancer, Prancer, Vixen, Comet, Cupid, Donder, and Blitzen. Soooo cute! Your blog has been a recent find of inspiration for me! I love looking at the things you can do with your nails! Oh these are so festive! Your Santa is great! I believed until I was about 10 or so, my parents always made it very magical so it was easy to think he was real =D. Ahhh you are such an artists! Rudolph is amazing! To Ice Queen, yes, I think a red rhinestone will be great for Rudolph's nose! Very festive! Your cartoon designs are always so good. I really like the polka dots too. Hi Rins! I haven't been by for your last few mani posts but OHHH! I Love your snowmen, and your cuppycakes and don't even get me started on Rudolph. He's so cute! Your nail art always gets me so so excited! <3 Merry Christmas from snowy Saskatchewan! PRETTY! may i know what kind of acrylic paint you use for drawing the cartoons? normal art and craft acrylic paint? or is there a certain kind for nails?